The new limited edition watch Tourbillon with Three Gold Bridges limited editions (Ref. 99193-52-001-BA6A), presented in the current 2012 Swiss company Girard Perregaux- , are the perfect example of classic style. Housing new round of classical form, made of 18K white gold, has a diameter of 41 mm and a thickness of 11.10 mm. Waterproof model reaches up to 30 meters. Domed anti-reflective sapphire crystal, set on the front side of the body, provides protection for the three arrow-shaped bridges, arranged horizontally to each other. In order to create a contrast with the color of platinum, the bridges are cut from rose gold. 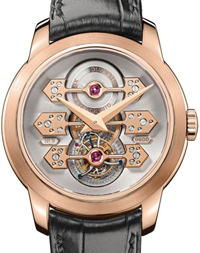 New Tourbillon with Three Gold Bridges limited editions (Ref. 99193-52-001-BA6A) operates on an automatic mechanism manufactory GP9600-0018 with diameters of 32 mm and a thickness of 6.26 mm. The unique size, collected at 31 stone, has a balance frequency of 21,600 vibrations per hour and 48-hour power reserve. Tourbillon 12 mm in diameter consists of 72 components. Time is indexed by the central hour and minute hands, made of gold. Tourbillon carriage on which a special needle through the second fixed, is located in the 6:00 position. New product is delivered on an alligator strap in black and equipped with a buckle of 18K rose gold. Please note that our shop will be quite difficult, as the novelty is released in a limited amount of only 50 models. Company Girard-Perregaux has pleased fans and precious stones, representing the version of the model Girard-Perregaux Tourbillon with Three Gold Bridges Diamond-Set (Ref. 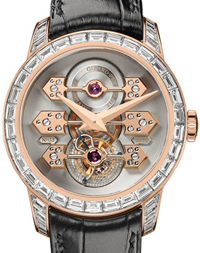 99193B52H001-BA6A) inlaid with shell 88 baguette-cut diamonds. A limited number of this version is 18 models.